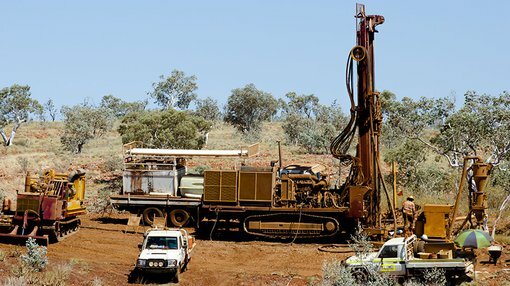 Core Exploration Ltd (ASX:CXO) today announced that its newly acquired Bynoe Lithium Project near Darwin in the Northern Territory is continuing to deliver immediate positive results, reporting high grade lithium assay results at a number of the project’s prospects. 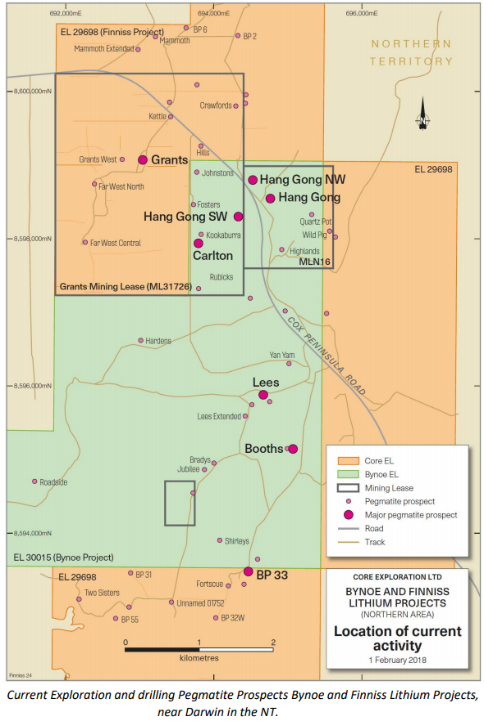 A stand-alone Reverse Circulation (RC) drilling campaign was carried out during December at Hang Gong, Lees, Carlton and Booths Prospects, all within the Bynoe Lithium Project, designed to investigate preliminary low-grade results obtained by the previous owner. These prospects all very close to CXO’s planned development of the Grant’s deposit, which is approximately five kilometres away. Today’s news follows CXO’s recent announcements that CXO had recommenced resource drilling at the high-grade BP33 and Grants Prospects. It should be noted that CXO is an early stage play and anything can happen, so seek professional financial advice if considering this stock for your portfolio. These high-grade lithium intersections are very significant, and this first drilling demonstrates the strong potential for Hang Gong and other historic prospects. The results indicate an improved grade, within spodumene pegmatites up to 20 metres true width, the higher grades intercepted by CXO’s drilling are the result of successful targeting of drill holes to intercept the pegmatites below the effects of surficial weathering. The pegmatites at three of these prospects (Hang Gong, Booth and Lees) comprise multiple pegmatites bodies that dip at a shallow angle. A similar high grade of mineralised intervals was observed across all four spodumene rich pegmatite prospects (approx. 1.5% Li2O at a 0.4% Li2O cutoff is consistent with the Grants Deposit). Additionally, individual metre-width grades of more than 2.0% lithium oxide have been recognised at all four prospects, and the maximum metre-width grade being 3.0% lithium oxide (from 70m in NRC004 at Hang Gong). The results of the targeted shallow Rotary Airblast (RAB) drilling program at these prospects are still being assessed, but the geological data has proven invaluable in the interpretation of pegmatite geometry and fine-tuning of the RC drill plan. For example, it has enabled the subsurface extrapolation of pegmatite bodies from surface workings to more distant, deeper drilling intersections. Based on these result, CXO plan to drill further down-dip with the aim of defining larger footprint pegmatites that have robust mining attributes. The newly drilled prospects will be followed up by RC and RAB drilling, both down-dip and along strike, as soon as access is possible following the wet season. Already, the acquisition of the Bynoe Lithium Project is delivering immediate positive results for CXO and the company has shown that it can move rapidly from first drill discovery to a JORC Resource in as little as six months.